Tyler Grant returns with another 10 weeks of blazing Bluegrass guitar. This course continues to focus on the essential skills with Tyler's easy to understand and song-based approach. 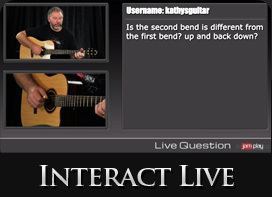 You will gain an understanding of Bluegrass rhythm, melody and learn how to play lead breaks. Tyler will also cover techniques like crosspicking, "taters & tags," and common runs. Add a few useful scales and you have one powerful lesson series. While we recommend taking the first Bluegrass basics, it isn't necessary! Anyone can jump in and follow along. In this lesson we offer a recap of Bluegrass rhythm techniques including the boom-strum, bass note variations, and strum pattern variations. We are also going to work through a new song! 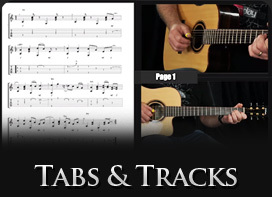 Tyler will review major, pentatonic and blues scales and teach four common Bluegrass licks. With this essential information in your arsenal, he will move on and teach a lead from a Bluegrass tune. This lesson is all about learning an instrumental Bluegrass tune. We will learn both the melody and rhythm portions, as well as several stunning variations. You'll love this song! In this lesson Tyler discusses two common Bluegrass techniques which he refers to as taters and tags. Once you learn these two techniques, he will show common examples and demonstrate how they can be applied to Bluegrass songs. Tyler launches into another lesson on instrumental Bluegrass tunes. 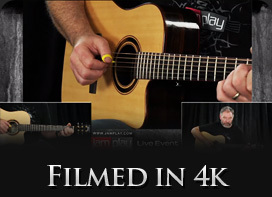 This time around he teaches some amazing variations that can be used to spice up your songs. By the end of this session you will know one slick tune. Tyler dishes out another venerable Bluegrass lead. He will make sure everyone understands the common scales, teach four more licks, and then teach a full lead break. This will leave your mind reeling and your fingers sore, but the end result is worth it! Tyler talks all about runs in the most common Bluegrass keys of G, C and D. After introducing the concept he will teach three runs in each key and show how they can be applied to songs. Tyler will talk about what exactly melody/strum arrangements are, teach the technique, and show how it can be applied to a blazing bluegrass tune. In this lesson we learn how to use the crosspicking technique. Three new patterns will be taught in addition to a song example. This is a signature Bluegrass technique! Week 10 is here, and it's time to learn a new song. Both the rhythm and melody will be covered, as well as some simple variations. Our series ends with a bang as this song is epic!